'The Expanse' is a television show that we over here at That Cat Blog have not had the pleasure of watching - YET! However they are clearly roping in a new demographic with their unusual Season 1 recap video - starring CATS! ... an American space opera/mystery science fiction drama television series on Syfy, based on the series of novels by James S. A. Corey. Set in a future where humanity has colonized the Solar System, it follows United Nations executive Chrisjen Avasarala, police detective Josephus Miller, and ship's officer Jim Holden and his crew as they unravel a conspiracy that threatens peace in the system and the survival of humanity. Seeing as how we don't have cable (shout out to Hulu and Netflix! ), and are obsessed with cats - which takes up 98% of our time and energy - we haven't gotten around to checking out this new show. Also - can we just address the show's description as a "space opera/mystery science fiction drama"?! We're already intrigued. Thankfully, this show's producers (or mar-CAT-ing team?) are clearly big cat lovers and have decided to release a YouTube video recapping season 1 of the series - using cats as the actors, and cleverly calling it a "recat". And what more do cat people love just as much as cats? Cat PUNS! This reminds us of the Key & Peele all-cats version of the Keanu movie trailer from last year. Don't you wish ALL trailers/recaps could be done with cats?! Can someone please start this production company already? Jan 31 Which One Of These 5 Personality Types Does YOUR Cat Have? 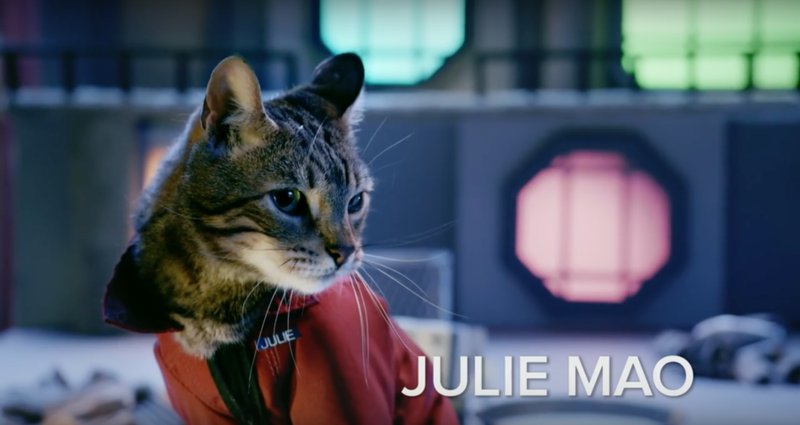 Apr 26 Keanu Trailer Remade Featuring MORE CATS!